White teapot on wrapping paper, oil on panel, 6x6"
The Daily Paintworks‘ challenge last week was to paint a white object sitting on patterned fabric using only primary colors and white. For this attempt I decided to use some turquoise, patterned wrapping paper instead. The wrapping paper had clever little snowmen all over it but after giving one snowman a try, I realized I didn’t have the patience or interest to try to paint all the details on them (top hat, scarf, etc.). 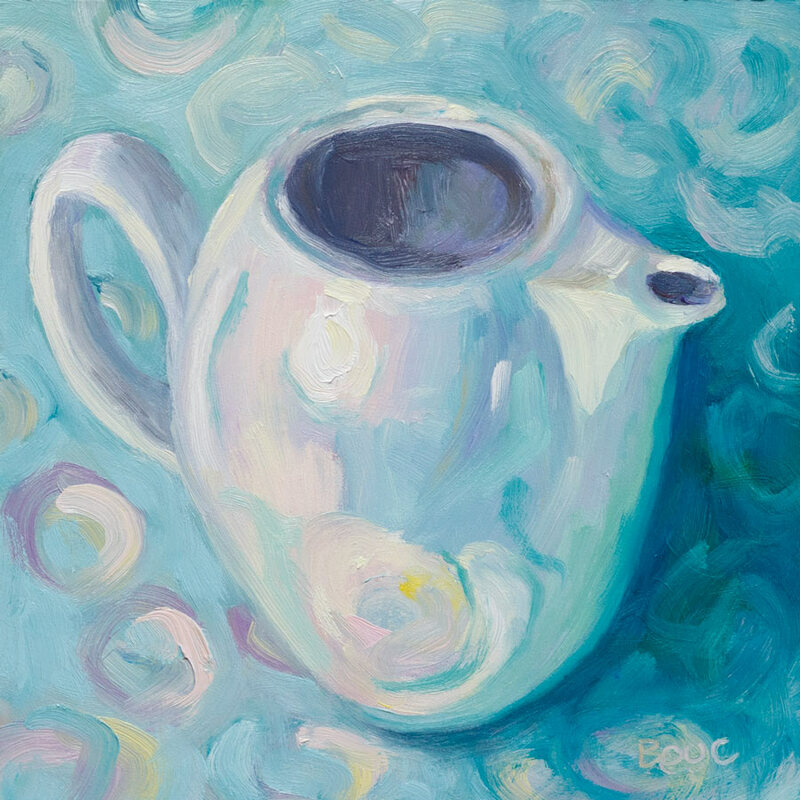 So I gave myself permission to abstract the snowmen into the circular, swirly shapes I saw reflected on the teapot. Since it was meant to be a painting exercise, I didn’t get too concerned with perfecting the painting. I just wanted to experiment with seeing reflections and building the form of a white object on a cool background. This is really lovely Jana! The colours and reflections are gorgeous. I like it, especially the way the reflections play on the surface of the teapot. I like it, the style reminds me of van Gogh. I particularly like that bit of yellow on the side of the teapot! Great colours. I especially like the way the colours of the paper are reflected in the jug.